Only 500 metres from Sainte-Croix Lake, This B&B is 6 km from the Verdon Gorges. For breakfast, you can enjoy homemade jam with French pastries. Situated on the ground floor, the rooms at Les Clés du Verdon are decorated in a Provençal style and feature a private terrace with views of the garden. Each one offers a tea- and coffee-maker. Free Wi-Fi in public areas and free private parking is possible on site. Guests can explore the historical villages of Aiguines and Moustiers-Sainte-Marie, both less than 10 km away. Please note that cheque payments are accepted only for French residents. Decorated in a Provençal style, the rooms feature a private terrace with views of the garden. They also include facilities for making tea and coffee. Extras in the deluxe rooms include additional space. 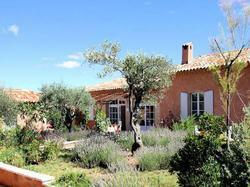 Decorated in a Provençal style, the rooms feature a private terrace with views of the garden. They also include facilities for making tea and coffee.